I’m currently in the car riding home from Ohio…Joey’s GPS on his droid says that we’ve got about an hour and forty five minutes to go. I’m definitely ready to be home; I miss my Shellikins and I am in desperate need of peace and quiet. I wish I had taken tomorrow off too, because I think it’s going to take me a few days to get over the whirlwind this weekend has been, which is disappointing since last week was so relaxing with two days to hang with my mom and then early Friday to read and knit and relax and watch some long-awaited trash tv (you are NOT the father!!). I took The Artist’s Way with me intending to be able to do some of the exercises, but I never got enough time alone to really be able to think about any of it. I also took a brand new, shiny, never-been touched notebook for my morning pages which remained unopened since I didn’t get any time alone to do those either. I’m looking forward to this twelve weeks to try to rejuvenate my creativity; I had it explained to me recently (by someone in the head-shrinking business) that some of my emotional issues these days come from the fact that I shut out the creative side of myself because that’s also the emotional side of myself and I have spent several years trying to avert any kind of emotional trauma by not feeling much of anything at all. I’d never had it explained that way…I’ve just been wondering all this time why I can’t write poetry anymore and why I don’t have creative ideas like I used to (and also why I’m so cynical). So, now that I have the anxiety/depression issues taken care of by some much-needed pharmaceudical help, I’m going back through The Artist’s Way (and I WILL finish this time) to try to reconnect with the part of myself that I’ve lost over these past eight or nine years that I’ve spent in emotional “survival mode” because of some pretty painful life events. CABLES!! I’m knitting cables!! Funnily, I realized about a hour into the trip that I forgot to pack a cable needle. I almost decided not to try cables, but I found a stitch holder (read: giant, honking safety-pin looking thing), and I made do with it. It’s actually worked pretty well. 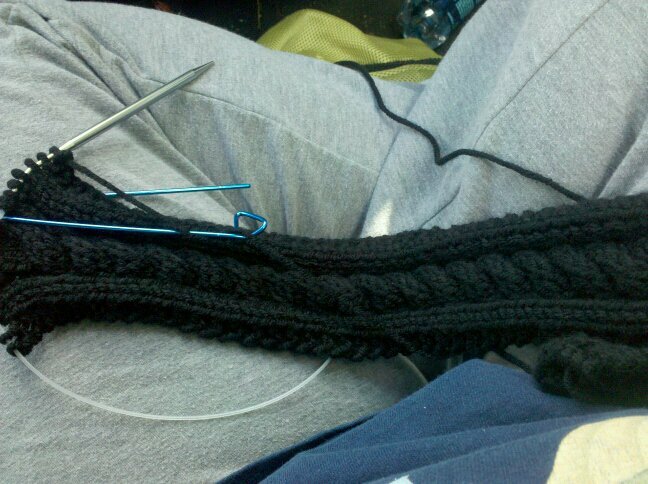 I tried cabling without the CN once, but I almost lost a stitch, so we probably won’t be trying that again for a while. On the food front, it’s been a terrible food weekend; on the way down, I had a Subway ham flatbread with veggies, too much Chex Mix, and lots of coffee. Breakfast yesterday was at Bob Evans and dinner was at Cracker Barrel (where I actually saw a group of prom kids coming in for our prom dinner. Ohio truly is a different world, for sure). Dinner tonight was had at Wendy’s. I’m over the fast food, and, after just now easing back from the Primal thing, I’m tired of fatty food…just tired of it. Tomorrow, I’m thinking about doing a green monster for breakfast and a salad for lunch and then going from there. My stomach is upset with me and I’m feeling fat, to say the least. Ha ha – I remember seeing your comment on Facebook regarding the prom kids at Cracker Barrel. Who goes to Cracker Barrel for prom?!? Your scarf is looking great, and oh my gosh, I would love an original handknit for the HEABlet. I was so shocked and overcome with your kindness when I read that sentence. Thank you so much! And here’s to a delicious green monster in the morning! I’ve been to Cracker Barrel once, when driving through Michigan last fall. I had a steak that tasted more like liver. Ewww.